The following are court results for the Observer area from Hastings Magistrates’ Court fromJune 19 - June 21. Jonny Lyons (aged 37), of Coronation Gardens, Battle, was sentenced to 26 weeks in prison after being convicted, on May 5, of possession of a bladed article (a craft knife) in a public place. The offence took place at Hastings on April 7. The offence took place during a suspended sentence for an earlier offence of being in possession of a craft knife in a public place, at Battle High Street, on November 5 last year. Magistrates said the reason for the custodial sentence was that it was the second offence involving a bladed article. Peter Collings (aged 49), of Hatherley Road, St Leonards, pleaded guilty to using threatening behaviour. The offence took place at Hastings on April 12. He was given a two year conditional discharge and ordered to pay £50 in compensation. Jack Banyard (aged 19), of Main Street, Beckley, was found guilty of common assault. The offence took place at Hastings on April 7. He was given a nine month conditional discharge and ordered to pay £50 compensation and £250 prosecution costs. Tara Casey (aged 39), of Earl Street, Hastings, pleaded guilty to driving a Nissan Juke vehicle on Earl Street, on April 6, with no insurance or licence. She was fined £200 and her driving record endorsed with six penalty points. Lazslo Eberheart (aged 50), of Southdown Avenue, Hastings, pleaded guilty to failing to provide a specimen of urine for analysis when required to do so under the Road Traffic Act 1988. The offence took place at Hastings on June 6. He was fined £120 and banned from driving for one year. Isaac Fuller (aged 28), of Chain Lane, Battle, pleaded guilty to stealing two Costa coffees, worth £5, from Tesco Express, Battle Hill, on January 30. He also pleaded guilty to assault by beating, at Tesco Express on the same date. He was given a one year conditional discharge and ordered to pay £5 compensation for the coffees and £25 compensation to the assault victim. Haroon Khan (aged 45), of London Road, St Leonards, pleaded guilty to stealing fragrance, worth £80, from Superdrug at Priory Meadow, Hastings, on June 3. He was given a one year conditional discharge. Robin Sharp (aged 35), of Denham Way, Camber, pleaded guilty to assaulting a woman by beating her. The offence took place at Hastings on June 5. He also pleaded guilty to damaging a front door and frame, at Hastings, on the same date. The court made a community order with a requirement of 60 hours of unpaid work. Dean Walker (aged 30), of no fixed address, pleaded guilty to stealing two cases of Stella lager and a packet of Scotch eggs, worth £19.39, from Tesco Express, Battle Hill, on May 19. He was sentenced to six weeks in prison. Magistrates said the reason for the custodial sentence was due to previous convictions and non-compliance with probation. Katherine Douglas (aged 53), of Hughenden Road, Hastings, pleaded guilty to damaging two police CCTV cameras. 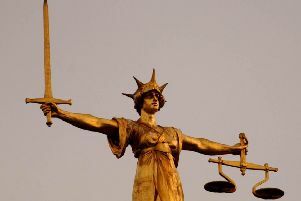 The offence took place at Pelham Place and Queens Road, Hastings, on June 7. She also pleaded guilty to damaging a shop window at Kampsons Pharmacy, and a door and shutter at Poundstretcher, Wellington Place, on the same date. She pleaded guilty to damaging the outside of Day Lewis Pharmacy, Mount Road, damaging a pillar at Flamingo Arcades, East Beach, damaging the outside of the Blue Reef Aquariam and Shipwreck Heritage Centre, Rock-a-Nore, damaging the Pelican Diner at East Parade, and damaging three post boxes and phone boxes, wheelie bins, benches, street furniture and bus shelters on June 7. She was given a one year conditional discharge and ordered to pay £200.